This ride seemed to throw everything at me. From extreme heat to southerly wind and rain; illness & mechanical concerns. To be fair, I didn't get much training in over winter. Actually, it may be more honest to say that I did not get any training in over winter. The weather was pretty awful, I had a short bout of illness. That said, following three road 1200's and a dirt 1100km event in eight months, I was overdue for some time off the bike. However I did get a small weather opening to get some hill training in :). As you can see, from the snow and ice in shot, it was perfect weather conditions to acclimatise to riding in Australia in early summer, or perhaps it wasn't :>. That said, Mt Ruapehu has been warming up somewhat since then. (See: Mt Ruapehu could blow at any time). I did get a pair of back to back 200's in shortly before departing for Australia. Whilst the wind served well for strength training, the rain on the 200 home may have been the instigator for mechanical issues experienced 900km later. I’ve digressed, time to talk about the ride. The briefing mentioned being ware of kangaroos, wombats, and magpies with these black and white birds described as dressed up as New Zealanders. Fair cop. Obviously no need to mention wallabies, they have proven afterall, that they are clearly no threat. (Although the locals seem to be claiming a recent draw between the All Blacks and the Wallabies like a victory). With the ride beginning from Anglesea at 6pm on clear and calm night, for the initial Bellerine Peninsula loop. This first 200km began in the early evening and featured sunset followed by a still moonlit night, of which was most beautiful at the point when the moonlight was being reflected off the water over Port Phillip Bay. Aided by good conditions and an early bunch, and a short time sucking Hamish’s wheel until I was dropped swapping my water bottles from my back pocket. Ooops, a little trickier to do in motion from under a reflective gilet. 197km & 3 controls (plus a secret control) down and a meal break in 8.5 hours, and I was well ahead of my planned schedule, a quick snack and I feeling great and ready to rock on!!! Some may like it hot, but I sure don't! I was still making good time to arrive at Apollo Bay (271km) before 7:30am, with a mere further 213km planned for the day, I was on schedule to arrive at Port Fairy (483km) at about sunset (8pm-ish) as planned. Unfortunately, it was a bit uphill & downhill for me all at the same time me as the morning became day and I started coming to a grinding halt unable to keep myself cool. In New Zealand I would have dunked my head in a stream to cool off, but here is Australia ‘t'is a dry and barren land with no such options available. I found the Lavers Hill climb to be arduous. On the one hand, this was a mere "Australian Mountain" and not much more than a false flat by home standards, but with the sun beating down, a lack of shade and the temperature at 32degC and rising, the energy was being sapped from me turning this into an epic climb. I consumed my three water bottles consumed in a mere 31km, and once I reached the top, there was a fairly hefty margin applied by the proprietors of the store on top of the hill. AUD$21 certainly doesn't go far there! Following the joy of the descending, the ride through to Port Campbell (367km) was scenic, but featured as little shade as possible, with views of the ocean to taunt me by never quite close enough to offer the chance to jump in for a swim. 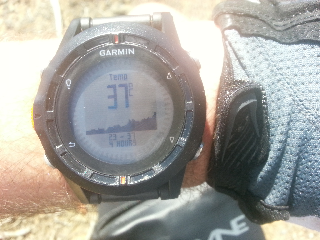 The temperature continued to soar, with my Garmin fenix watch peaking at 37 degC. I can assure the last and warm mouthful of water in a bottle is neither thirst quenching, nor refreshing. An ice bath would have been great at the Port Campbell control but I settled for beans on toast followed by some COLD ice cream. After spending an hour so at the control, gaining some respite from the sun I headed back out bound for Hopkins Falls and Port Fairy. I was soon struggling in the heat and pausing for rest whenever a shaded opportunity presented itself. The time advantage built previous evening all but evaporated as I arrived for for a quick break for soup at Hopkins Falls (435km) on dusk. I started experiencing cramps at this control but pushed on for Port Fairy. Riding late into the evening, without the temperature seeming to get much any cooler, eventually arriving at Port Fairy (483km; 11:25pm) struggling with the heat and unable to eat and promptly collapsed into a heap obviously the floor in the corner, hoping to feel better after I woke up. The offer of a comfortable bed being a few too metres away for me at the time lol. 90 minutes later I woke with simultaneous cramps in right calf; left quad; right foot & left hand! I felt rested and awake but also like I was being slowly roasted. Still feeling hot and flustered I was struggling to eat and get food down, and could barely drink a cup of tea! I was incredibly uncertain of my capability to complete the ride. In fact I was almost certain I would be recording a rare DNF at this point. Peter McCallum was quite big on telling me to HTFU (refer rule #5) at this point and advised me it hadn’t been hot at all of course, hails from North Queensland. I must invite over for some winter rides, perhaps in the deep south? 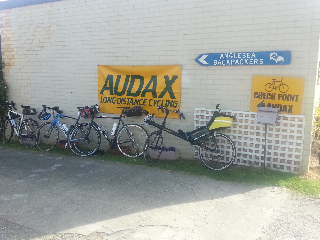 A big thanks to the vollies at Port Fairy who helped me get back on the road. Randonneuring is all about the finishing and not racing, or lowest net time. It is crucial to never redraw until it really is absolutely impossible to complete the event. I made some calculations of latest time I could leave for the next checkpoint at Macarthur and keep within the time limit. It came down to, if I could keep scrambled eggs on toast down I would continue. With this successfully I achieved Phew, not feeling great but I was still rotating. Julian and I set off for Macarthur together. Arriving at Macarthur (532km) right on the close off time, I had soup for sustenance and headed onward for the well setup Dunkeld (600km) control where I was able to move on soup and consume a solid baked spud before heading up and through the Grampians with Mick. We tried to ride together but had different strengths so as the it briefly warmed on a sun exposed clibn and I soon found myself riding alone again climbing, at least until reaching a temporary road closure for a quick snooze during a 46 minute wait before charging with springs in my legs for Halls Gap (665km). I appeciated both the scenery and increased shade that this hillier, and more forested section of the ride presented. A brief snack at Halls Gap before heading out for the return trip to Moyston (697km). This section seemed to drag on for a mere 31km, but after getting my card signed and turning around with a tailwind, I could understand why. This provided a nice quick return back to Halls Gap (729km). Leaving Halls Gap, just before dusk left a chunk of night riding back to Dunkeld (794km) and featured a certain amount off kangaroo slalom as I made my way through the Grampians to Dunkeld, during which the wind turned and the temperature finally began to cool down. At Dunkeld I enjoyed another spud and a two hour sleep during much of the rain before heading back to Macarthur (863km). With the wind now a south-westerly with showers in the air, I was more-or-less riding home conditions now. With the weather bringing my body temp down, I was feeling much better and felt like I had powered down to Macarthur and onto Port Fairy (911km) regardless of the strong head and cross winds. Some of the other riders told me later that they thought they were going bit be blown over, but blowing at 50km/h – surely a mere gentle breeze? I was pleased to arrive in Port Fairy (911km) in better health for many reasons. Perhaps one of the more important was that this time I would be able to the apple crumble that I unable my previous time through this control. On the ride back to Hopkins Falls (960km) I began to feel some movement in my cranks for the first time, and by the time I reached Port Campbell (1028km) it was becoming excessive. While I ate dinner, some of the helpful volunteers took a look and soon had the very worn ball bearings living in a grease bath that would hopefully survive the remaining 200k. All the grease had been washed out in by rain some time earlier, so the bearings wore themselves out. I don’t usually ride the Madone in the rain unless it is during a 1200, so with no play before I started it was disappointing to encounter this issue in the middle of such a long ride. I did get drenched at home the weekend before departing for Australia, so that may not have helped. I have subsequently discovered that Trek uses a proprietary flavour of bearings in the Madone, that can only be ordered from Trek. A Madone BB90 is not like other BB90's. Non-standard components are not exactly ideal for long distance cycling. My LBS suggested riding with them so worn was not a good idea because with this design (no press-fit bearings and no sleeve) as it could lead frame damage. The return trip over Lavers Hill in the dark seemed to take an age, conscious of the bearings and crank movement I took it easy and battled a fare amount of tiredness too. I rode some of the section through to Hordern Vale (1102km) with Sarah & Bec (see Sarah’s GSR Video). The climb up to the Hordern Vale control sort of reminded me of the uphill arrivial at the controls on PBP last year. I was able to get a couple of hours sleep, once again at the same time as heavy rain before leaving on rain break for the descent to Apollo Bay and a coffee to warm up before the final push back to Anglesea (1200km). By the finish I was having reasonable difficulty changing the front derailleur due to extensive crank movement, so spent most of it pushing the big-ring (refer rule #90). It felt a strong finish in my legs, but likely only in the context of already have 1100km in the legs. I was pleased to finish, following an over-time-limit on the Kiwi Hunt, and after it wasn't looking good at Port Fairy, after riding in the heat on day one. To top things off, the Town Crier arrived at the post-ride barbeque and welcomed all the international riders (including those from New Zealand even). We were presented with Aussie flags and kangaroo pins. Completion of 1200’s continues to leave me with a feeling of accomplishment, and I’d like to think I have more many more 1200’s in me yet! With 1200 routes selected proudly by local organisers to show off there part of the world, they present an excellent way to get out and see the world. I felt well looked after on the GSR, and think I will be back again when it is next schedules in 2016. Apparently I was not the only person to suffer from the heat. About a quarter of the 1200km field, and 10 of the 12 1000km riders were unable to continue. I hope you all find conditions more in your favour for your next rides. And a huge thanks to ride organiser Stephen Rowlands and the army of vollies that organised the ride, kept us fed, watered and rotating for 1200km. (sorry I can’t recall all of your names right now. And a special thanks to Dave for transport to and from Melbourne. I didn’t take many photos on this ride, but you can enjoy more multimedia from the ride visit the links below. Congratulations on the finish and thanks for the great write-up. It was good to see you again.